Two things came to mind the instant I saw the collection: First, my girlfriend, Kinsi, who could (and would) rock this collection. Second, the famous Elsa Schiaparelli leopard hat. This line falls into two distinct categories for me. The first is wildly sensual and would be my go-to outfit for any event requiring seduction or power-through-feminine-darkness. The second half was, WTF? Every outfit based in black I loved. I also think the animal print tights are incredible and I want every single pair. I’m pretty sure this was my favorite outfit, though the one above is killer. Sadly, the start was my favorite by far. The show then moved into some fun, but less awe-inspiring pieces, lots of leather. These man repeller pants are great. And this top is the only “puffy” piece from the group that I liked. It took me a while to pick up on the animal print that was painted onto the models’ hair. I’d never see something like that before and I thought it was clever nod to the animal stockings. Then came the “What the fffff” moment for me. 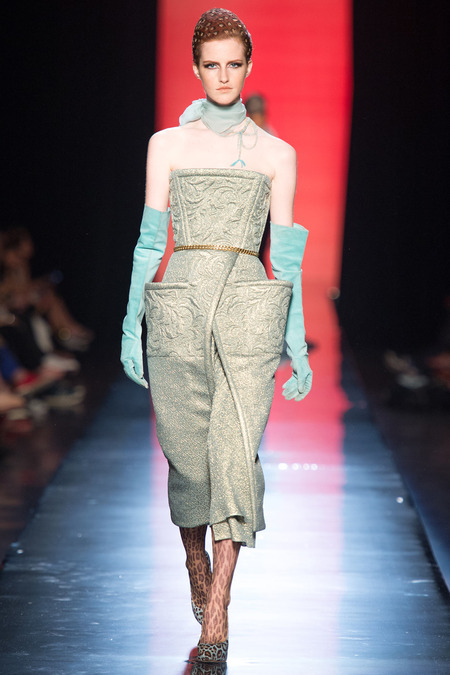 I am all about taking fashion a step beyond in a runway show, but this completely lost me. The headpiece was distracting from the outfit (which I hated, due to the headpiece, but once I got over the initial shock I realized that I do like) incongruent with the rest of the show and just weird. I don’t get where this was supposed to be going and I think it was a major flop. I recommend going back up and re-looking at the first outfits but to give you some more fun, here are two outfits that are almost fairy-tale worthy in their detailing. It’s winter-queen and elven maid*, in my mind. Thank heavens for those tights. They keep me happy. *Buddy the Elf not Arwen.